If your hair is prone to frizz, rainy days can feel like the end of the world. But it doesn’t have to be that way! 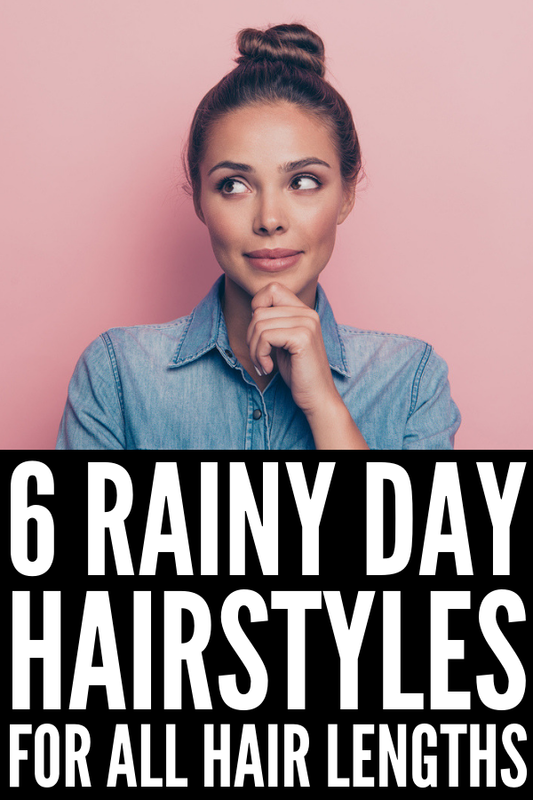 If you feel like rainy day hairdos always spell disaster, don’t fret, because there are actually plenty of cute hairstyles for rainy days! The truth is, you can’t beat frizz, so you might as well embrace it! Take a look at our best tips for frizzy hair and rainy day hairstyles we love! Mornings can be a rush, but if you want to ensure your hair doesn’t frizz up in the rain, you have to take the extra time to make sure it’s bone dry before running out the door. Dry it properly with a blow dryer and make sure it cools before going outside (this ensures water vapour can’t make its way in). Stay away from brushes when you’re detangling your hair and instead stick with wide-tooth combs. Brushes will make your hair frizz up much more, so save them for sunny days. You may be tempted to pile on holding product when it starts raining, but that’s going to do much more damage than good. Add a touch of an anti-frizz product, but keep the application light. When you need to touch up some frizzy parts of your hair, use a saltwater spray. This way you fight water with water, which helps combat frizz. Spray your hair with a little bit of saltwater spray and scrunch it from the middle of the hair to the tips. Loose, tousled braids may look great when the weather is warm and sunny, but it’s a completely different story when it’s rainy outside. When you put your hair in braids or plaits, make sure they’re clean and polished to keep frizz under control. You may think that oils from your hands would help smooth out your frizzy hair, but it doesn’t work that way. Avoid running your fingers through your hair as much as possible to avoid letting moisture into the hair shaft, which makes your hair more likely to frizz. Coconut oil is one of the most hydrating oils out there, making it ideal for taming frizz. Whenever your hair is feeling dry or frizzy, run a touch of coconut oil through it, focusing on the ends rather than the roots (you don’t want to make your scalp oily!). Apple cider is a remedy for everything from detoxing your body to banishing bad breath, and it doesn’t stop there. It’s also an awesome remedy for frizz. After you shampoo your hair, pour apple cider vinegar all over your hair and let it sit for 30 seconds before rinsing it out. Condition your hair afterwards as normal. Almond oil and egg are the ultimate combo when it comes to combating frizz. Almond oil acts as a natural hair emollient and conditioner, and due to its high protein content, the egg repairs damage in the hair shaft. Combine ¼ cup almond oil and 1 raw egg and apply it all over your hair. Let it sit for 40 minutes and rinse it out and wash with shampoo and conditioner. Mix together one avocado with one cup of plain yogurt to create a frizz-fighting hair mask. Avocado contains vitamins B and E, which nourish and repair your hair, and the yogurt offers a deep condition. The halo braid, also known as the around the world braid is feminine and sophisticated and will stay in place on rainy days. Watch the video below to learn how to get a halo braid for short hair. Another way to get cute rainy day hair is with a double French braid. It ensures you have a polished look all day long and that frizz stays under control. This tutorial will show you how to get the look! Using a bandana is another great way to keep your hair tame in the rain. In the video below, you get not one, but six 1-minute bandana hairstyles perfect for medium-length hair. As we mentioned above, stay away from loose braids on rainy days. Instead, go with a polished braid like the half up crown braid that will stay in place and keep hair off your face. When all else fails, throw your hair up into a top knot. This keeps your hair out of your face, and even if it starts to frizz, it still looks chic! Here are two ways to master the top knot for long hair. Dutch pigtails are one of the most ideal hairstyles for rainy weather since they keep your hair slicked back and polished. Check out how to get the look below! You don’t have to be afraid of the rain any longer! Try these rainy day hairstyles and look amazing rain or shine! Did you love this post on rainy day hairstyles? We’d love if you shared this post on Pinterest! And if you want more gorgeous hairstyles, make sure to follow our Beauty Board on Pinterest!